Check this space for updates and details as the date draws closer. 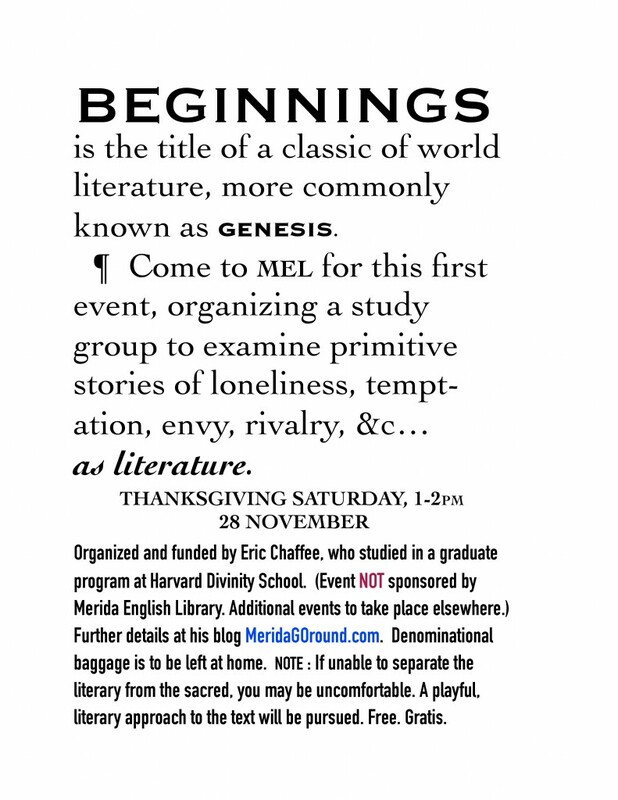 Perhaps you’ve noticed the ad below in Merida English Library’s newsletter. It’s an invitation to a conversation, not to a lecture. I’m hoping that you, and others, might enjoy discussing primitive stories which touch on human nature — stories that could enhance our understanding of ourselves and our interactions with each other. Of course, there will be some god-talk, as God is a character in these stories. There is likely to be some irreverence, as we may have issues with this first-appearing character. We will need to suspend doctrinal positions, endeavoring to ask apt questions of the text. Right questions, rather than bright answers, will be our focus. Civility will be maintained at all times. This is an experimental project which cannot get far in a single hour. (We will examine only a small portion of chapter one at this first meeting.) I’m very grateful to the Board of MEL for allowing us to convene in the courtyard of the library, but we must move elsewhere if we wish to continue this conversation. Please bring your spontaneity. ~eric.